For my 8th grade history project, instead of writing a paper, I built a cardboard replica of the Canterbury Cathedral. Growing up Des Moines, Iowa, with a father who was a professional artist, meant art supplies and encouragements were always available. I have worked as an artist off and on since graduating as an art major in 1980 from Nebraska’s Concordia University, often freelancing as a graphic artist and illustrator. Over the past decade I have focused on watercolor and in 2013, was inspired by a book about people who keep sketching journals. I began filling sketchbooks and journals with pen, ink, and watercolor sketches. In 2015, the University of Arizona Department of Registration and Transcripts (where I worked for 15 years) commissioned five watercolor sketches to enhance their website. Now I’m retired and spend my time documenting life and travels in sketchbooks. The Hearst Center for the Arts in Cedar Falls in Iowa, featured my watercolor paintings in a family-themed show in summer 2017. 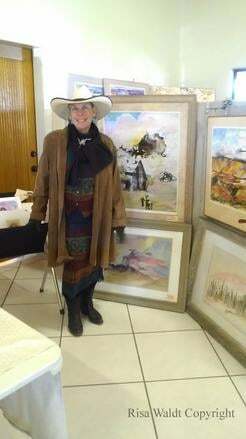 I’ve also participated in a show in Oro Valley, where six of my watercolor sketches of the ranch were showcased. Creating silver and gold jewelry is more constructive than lying on a psychiatrist’s couch -- for me, anyway. As a metal artist and designer, I view jewelry as a three-dimensional wearable art. Yes, you can hang it on a wall or you can hang it on any part of your body, which has been done since the 17th century. I have been silversmithing for 20 years and have been inspired by designers, who have a background in architecture and engineering. Lately, since the world has become increasingly complicated and chaotic – I’ve entered a new phase of metal design, which I call minimalism. Consider Plato’s argument, non-physical (but substantial) forms or ideas represent the most accurate reality. Thus, I’m incorporating additional basic geometric forms in my designs, along with the idea of the forms reflecting aspects of my environment, past, and present. Joe Bourne is an award winning vocalist, well known in European circles for what he has achieved in the popular, light music genre. He always seems to capture the audience with his own style and warm mellifluous light baritone, voice and his dynamic showmanship. Joe is a popular performer in the Tucson area as well as around the states and abroad. However the roots of this talented singer / entertainer are anchored deeply in the Jazz, blues and spiritual music. Born in Cambridge, Massachusetts, he was inspired by many of the big names of Jazz that toured the Boston area. While performing on the German cruise ship MS Europa as it sailed between Manaus, Brazil and Cape Town, South Africa, Joe was “bit” by the painting bug after attending a class in watercolors. Since then, he has attended several artists' workshops and created many paintings in watercolors, acrylics and encaustics - a painting style that uses hot beeswax and resin. 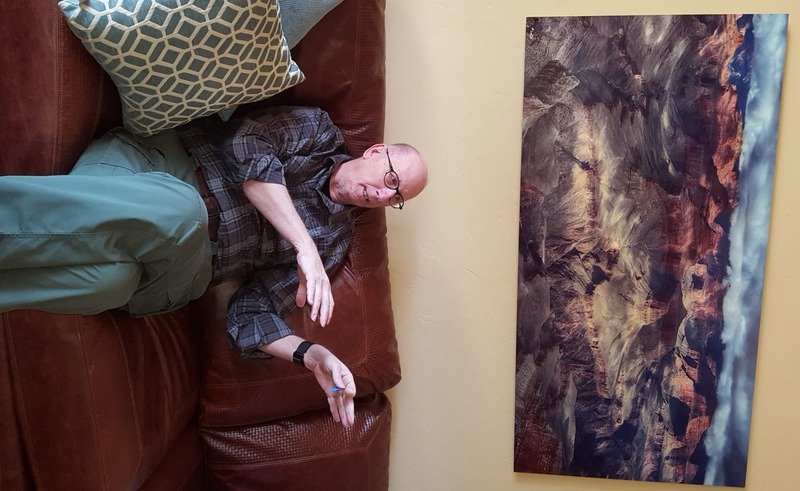 The paintings are mostly influenced by his concert travels around the world, and he derives new inspiration from the forms and rhythms of our big Southwestern skies, mountains and deserts. His art is often embellished with unique finds, such as copper splashes, metal tubing, gemstones and various papers. What could be more fun than living in Southern Arizona and being inspired by the scenery and sunsets? The occasional winter snow. I’m so pleased to be presenting at Absolutely Art Gallery and Gifts, near some of the most beautiful sights in the area. I’ve used this inspiration to create acrylic paintings and hand thrown pottery, which reflect the colors and moods of Arizona. I’ve been painting and drawing for personal pleasure for many years and decided to share my art a few years ago. I began throwing clay roughly three years ago – the process of creating on the wheel and watching colors develop through the firing of the clay is exhilarating. I’ve added a three-dimensional aspect to my art by creating pieces that are both functional and decorative. I hope you will also be inspired by the colors and moods of the desert, interpreted in many ways, on canvas and through clay. 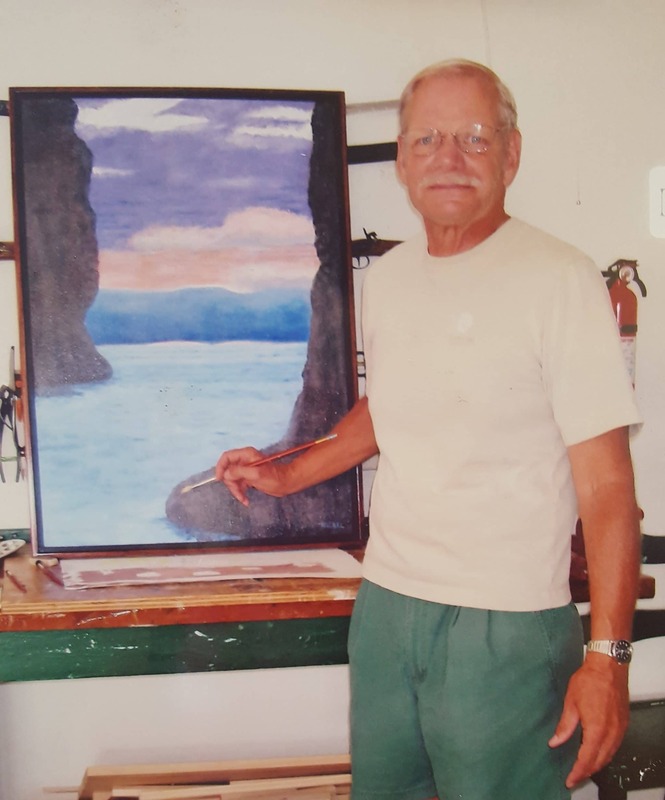 After retiring from a career as a College Professor Richard Bynum moved to SaddleBrooke, AZ where he found many instructional opportunities to further his interests in oil painting, pottery and sculpting. In 2007, he began taking painting classes from Wanda Tucker (Oil Painting) and continues to do so at the present time. He has also taken classes from Laurie Brussel (Drawing), Cindy Taylor (Composition and Light), Carol Ann (Composition), Titus Castanza (Portrait & Landscape), and Loretta Sprigings (Portrait & Landscape). These learning experiences have provided the opportunity to develop painting skills as well as the enjoyment of self-expression through art. Growing up in New Mexico, he was always inspired by the high desert vistas, and southwestern plants and animals. His current work has been most influenced by Matt Smith, Tony Pro and Titus Castanza. He is currently a member of the SaddleBrooke Fine Arts Guild where he enjoys painting with other artists. At about the same time Richard Bynum became interested in Native American pottery. He has studied under Dora Tse-Pe Pena, a well-known Native American potter who currently resides in the San Ildefanso Pueblo, and has also studied under several potters from Mata Ortiz, namely Nicolas Quezada and his two sons, Leonel and Jose Quezada and Oralia Lopez. The majority of work has been in making pottery using the hand coil method, and recently he has been exploring sculpting. His pottery making has been greatly influenced by many Native American potters and he has focused on the grace of line and shape that is both functional and artistic. 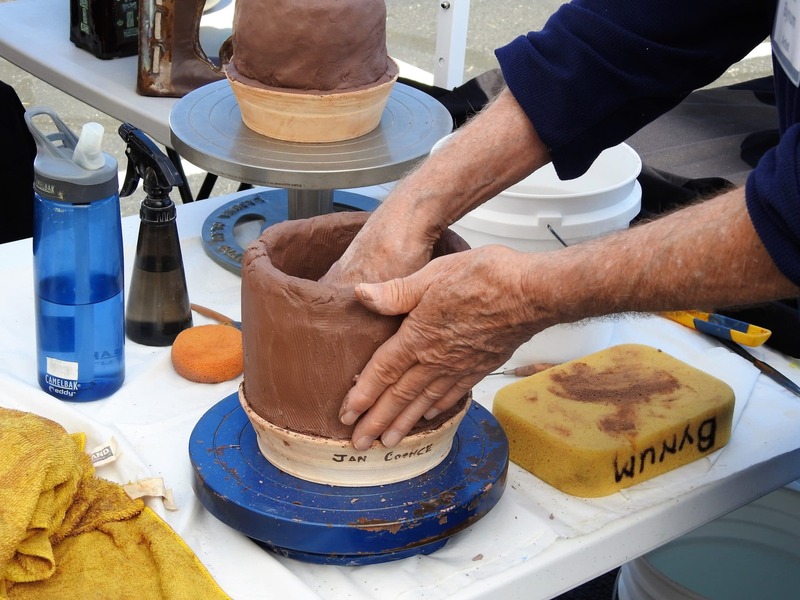 He is currently a member of the SaddleBrooke Pottery Club where he practices his art and teaches classes in making hand coiled pottery. Born in Denver, Colorado, Bruce started his art career in the screen printing business as an apprentice to Gene Licht in New York. Capra quickly became a master screen printer. He screen printed works of art for such notable artists as Andy Warhol, Roy Lichtenstein, Earl Biss, Rance Hood and many others. Capra attended the Foothills Institute of Art in Golden, CO. He studied under Greg Wilhelmi, an associate educator at the Colorado Institute of Art in Denver. Capra also attended the Missouri Auction and Appraisal School. As a fine art auctioneer for over 40 years, he has conducted over 1,000 fine art auctions around the world. Capra has been represented in many galleries around the country and his works can be found in both private and corporate collections. He has studied the approaches of many artists; however Kandinsky, Dali, Miro, Disney and the Impressionists have all had the utmost influence on his art. He starts a painting with several vibrant lush colorful brush strokes. As it progresses, the painting almost like “magic” finds its own direction and what it communicates. Because we all tend to look at what is in front of us, the best photograph may be behind us. My first camera in childhood was a Kodak Brownie that I aimed at anything my eye found interesting. With a camera always in hand, I pause wherever I am to capture fleeting moments – beautiful flowers, rolling landscapes, unique sunsets at last light, surprise appearances of wildlife, and special moments celebrating life. My photography experience includes owning an advertising agency and commercial photography studio, as well as holding the role of Director of Marketing Communications for a Fortune 400 corporation. During these years, my technical expertise and eye for photography continued to develop. These experiences support a transition to the world of digital photography and have enabled me to photograph nuances of light, composition, and color. To me, the use of advanced digital software compares to the artist and his palette of paints. As a 30-year member of the American Society of Media Photographers, I studied side-by-side with some of New Jersey and New York’s best photographers. I’ve also studied with Jay Maisel and Al Satterwhite in New York, as well as Sinar Bron, the world leader in photographic lighting. Tony and his wife, Gale, moved to the Preserve in SaddleBrooke to be closer to their family in San Diego after 28 years in Rock Hill SC where we were President and first lady of Winthrop University for 24 years. He began to experiment with digital imaging to relax from his University duties. He is self-taught and uses digital images as his sketches. Then he begins to create by manipulating the image and experiment with size, shape, form and color. Not knowing what will emerge creates the emotional element in the creative process for Tony and fulfills a deep seeded aesthetic need. Being a digital artist is a journey of discovering what can be. The manifold opportunities inspire him to collect new images and experiment with new ideas and techniques. Although he generally creates images on canvas, now he translates his images onto wearable art, such as silk wraps, ponchos, scarves and bags. His work has been acknowledged in local and regional juried shows including twice in the Artfields competition for the best artistic creations in the southeastern states. Bonnie’s primary interest is in creative, abstract design, and for over 25 years expressed that passion with a focus on artistic floral designs. She created and presented a number of programs in abstract floral design for various groups, and was featured for several years at the Creative Floral Arrangers of the Americas annual meetings, an international organization that supported growth in the creativity of floral arranging. 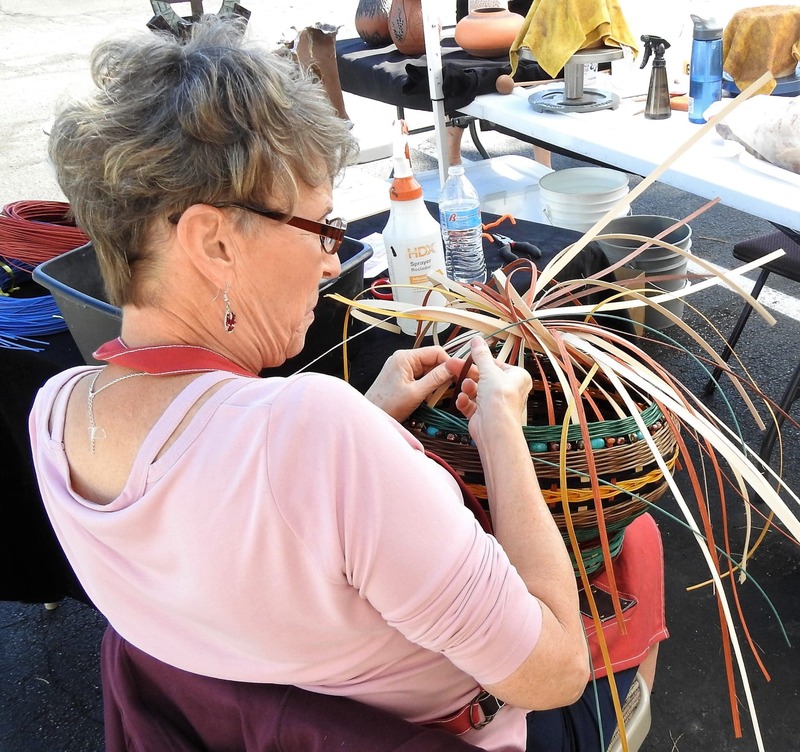 Since relocating from Minnesota to beautiful Tucson in 2013, her creative interest and direction has evolved from floral design to reed weaving. Her focus is on designing creative, dramatic woven objects that include baskets and wall art that often incorporate some form of local plant material. Jeanne has been experimenting with various two and three dimensional art forms for over 30 years. Initially she focused on traditional drawing and painting processes. Due to her experimental nature, she quickly moved into creating innovative techniques in her art forms. For the past 14 years, she has chosen to create with acrylic inks because of the rich, luminous color palette and other unique qualities not available with traditional watercolor or acrylic paints. 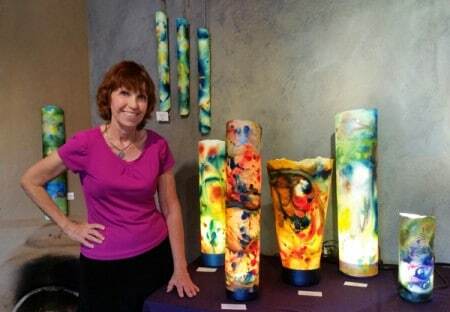 In 2011, Jeanne developed a technique of lighting her painted paper sconces with LED bulbs and created what she calls – “LumenArt” which are table lamps with bases. She then developed other innovative techniques to sculpt the painted paper into “wall sculptures” in a variety of different forms and she discovered ways to light the wall sculptures with LED bulbs. She has entitled these “Inspired Artscapes”. Jeanne applies her creativity to her original artwork and also to innovative solutions to improve her product quality, such as incorporating the use of a 3-D printed Lucite base for the Mini LumenArts. Early in her career, after earning a Master’s degree in Education with an emphasis in art, she taught elementary school. During that time, she developed and taught an innovative weekly art program for 300 students from ages 8-13 to develop their creativity through providing a stimulating environment and a variety of resources. 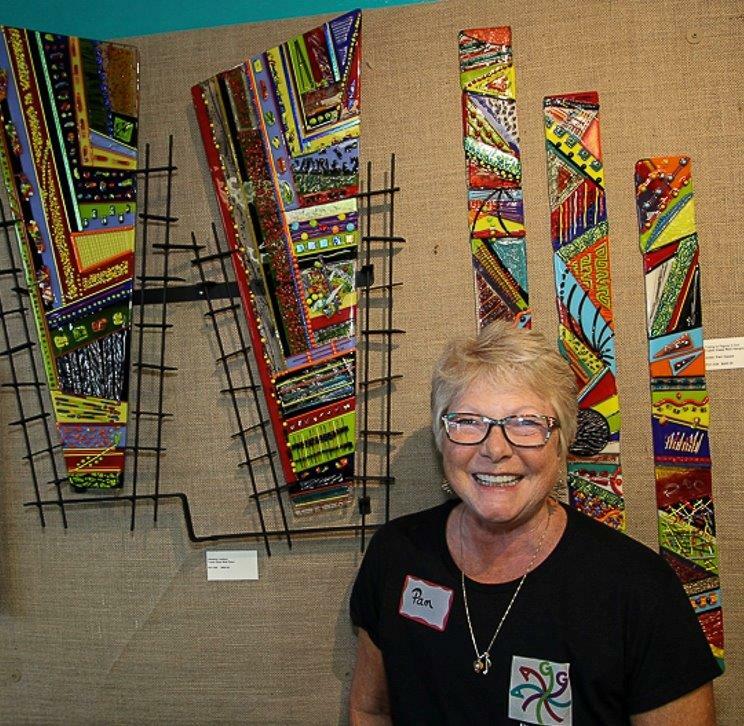 Jeanne has participated in many different local Southern Arizona art venues since 2011. 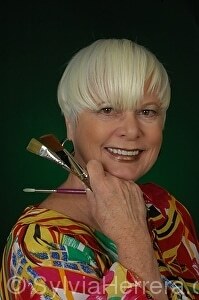 Jeanne’s personal art philosophy: Art continues to be transformational for me! I’ve not only learned to color outside the lines, I continue to learn how to live outside the proverbial BOX. I have been sculpting since childhood, beginning with Ivory soap and a jackknife at age eight. Since mastering permanent media, I have enjoyed working with earthy substances such as terra cotta and wood. Prior to moving to Tucson, Arizona, my prize-winning bronzes were galleried for several years in Flagstaff, Prescott, and Sedona. Now, my chosen medium is desert detritus of all sorts. The evolved creatures are collectively called Desemals, however each one has its own human name. They name themselves as I create. The primary bodies of Desemals are most often made of pods, seeds or the dry fruit of cacti. Heads, limbs, and other protrusions can be made of virtually anything in our generous desert. Bases are often created from Cholla or Saguaro cactus, but may also include Ironwood, Hackberry, Greasewood, Mesquite, Palo Verde, Ash, Willow, Juniper, Walnut, Cypress, Pepper, Catclaw, and/or other types of wood. Sometimes rocks are found in a wash or in the wild and I utilize these in my pieces in conjunction with the other substances. Judy has long been curious about why she finds something beautiful… why a particular painting or sculpture or scene in nature for that matter works visually, and that curiosity informs her artistic expression. 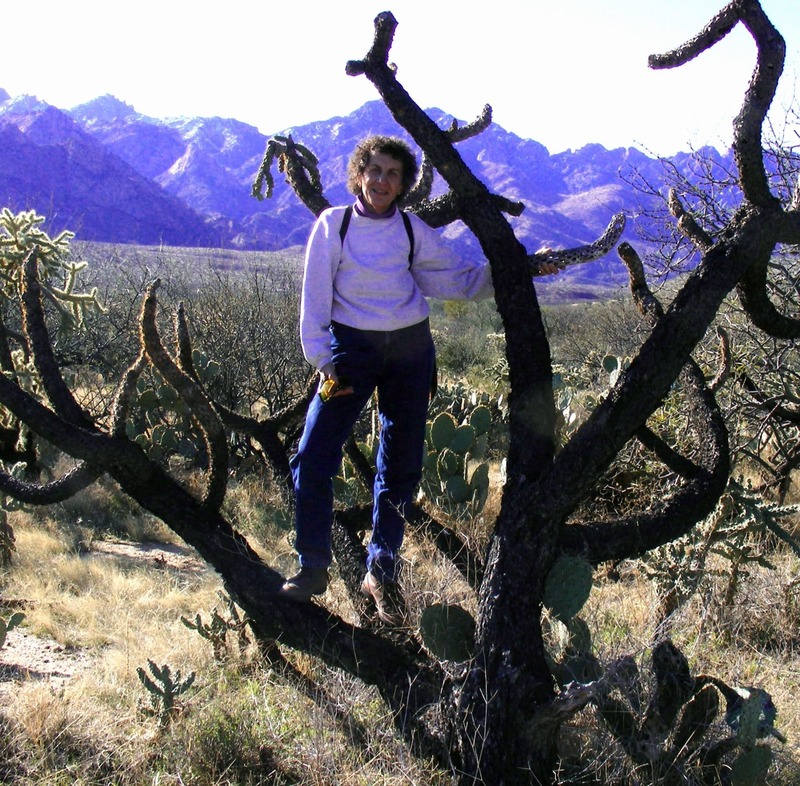 She fell in love with the Sonoran desert when she moved to Tucson 15 years ago… the adaptations of the plants and animals that allow them to thrive in a harsh climate, the palate rendered by the clear air, the rugged mountains, and the hidden treasures that emerge whenever there is water. Ceramics, with its materials derived from the earth and the blazing atmosphere inside the kiln, is uniquely suited to forms that are inspired by nature and the Sonoran desert. The textures, forms, and complex colors found in nature inspire her sculptural work and functional pieces. Pam grew up surrounded by art and artists all around her. Her father’s career and personal interests was in the world of art. She was always encouraged to be creative. Her mother was a seamstress who eventually opened a Gift Shop in St. Paul, MN. Her brother has metal art displayed in the Gallery. Pam chose to study art as her major in college, pursued a career in the travel industry, and became a practicing artist after leaving travel. 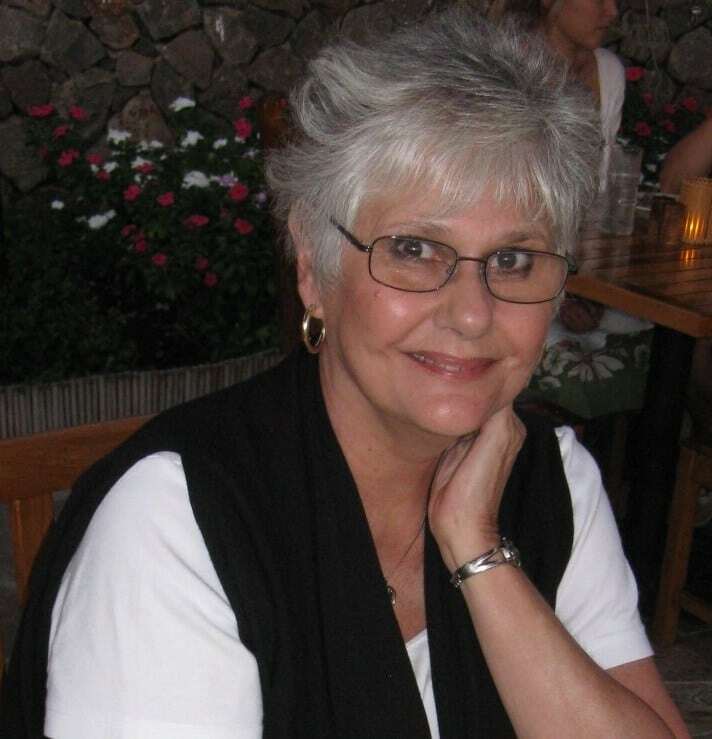 Her travel career began as a travel agent and ended with her managing Carlson Wagonlit Travel’s franchise division. She loved travel and her position with Carlson Wagonlit Travel made is easy for her to explore exciting places, in many parts of the world. The experiences of these many people and places became etched in her memory. 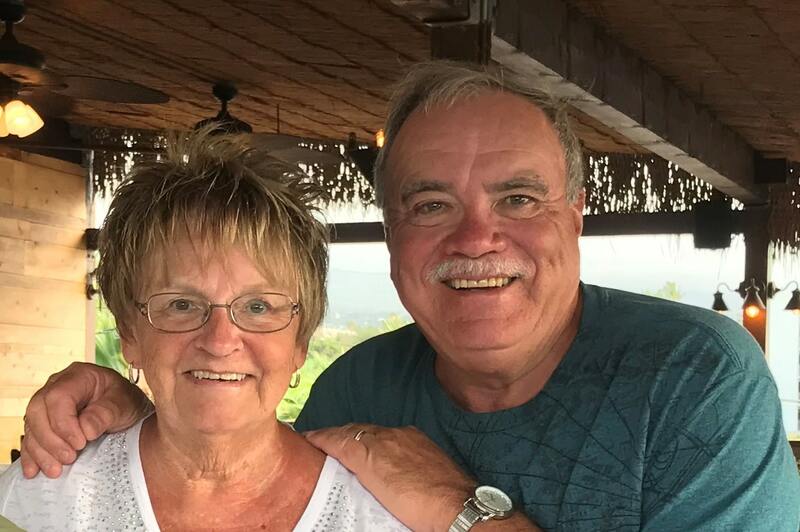 After retiring from the travel industry, Pam married and moved to Houston, TX where she was able to spend quality time raising her son with her husband, Bob. How did they end up in Tucson? Pam’s father retired to Tucson and Pam & Bob fell in love with the desert and the climate Tucson has to offer. After moving to SaddleBrooke, she met 2 friends who introduced her to fused glass. The rest is history. Pam loves a wide range of colors and shapes and how glass provides a great opportunity to be creative. With glass, there are really no limits and it is fun to create new designs and techniques. Her artwork is whimsical and fun. Pam is the owner of Absolutely Art Gallery & Gifts. She is delighted at the reception the local community has had to the gallery. New artists are added to the gallery frequently and the artwork changes all the time. Bob spend his working career as a Plant Engineer at a Printing Plant. When he retired, he and his wife, Karin, moved to Bellingham, Washington. Bob is not one to sit and be idle, he soon discovered that he had to do something rather than be “retired”. He began refurbishing homes, which he thoroughly enjoyed. Bob says that he has always “enjoyed building stuff”. He has a love for woodworking and feels that may be due to the many varieties and movement in the wood. 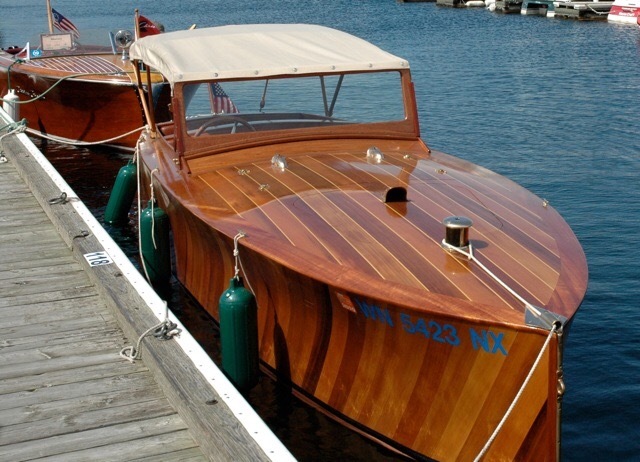 Bob built a wooden Runabout Boat, even casting all the metal components himself. Moving to Tucson in 2012 provided Bob an opportunity to continue his love of woodworking. He is always exploring new ideas and is very creative. Bob has also helped build many of the stands in Absolutely Art Gallery & Gifts. 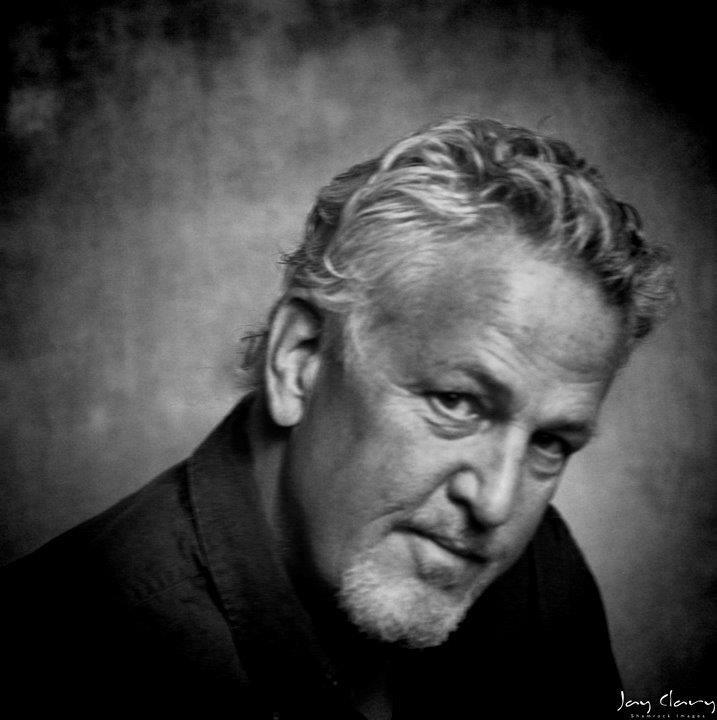 Jason is a photographer based out of Tucson, Arizona. He graduated with a Bachelor's Degree in Multimedia Cinematic Production from Hawaii Pacific University in Honolulu, Hawaii. It is there he further learned photography and film. The style of photography is Photoshop, aerial, landscape and portraits. Jason also has a background in video as well working on the CBS television show Hawaii 5-0 and local Tucson projects like The Tiny House Movie and That 80’s Guy. His hobbies include flying drones and working on Photoshop photography. Jason has displayed at several locations in Tucson. David K Grant graduated from the film school at USC in 1981. He worked in broadcasting, radio, TV - CNN and Univision as a sports producer and director until he joined Peace Corps in 1990. On his return from Chad in 1992, he taught special education in Los Angeles while he earned a doctorate in international special education issues, with field work conducted in Mexico, (by bicycle from Tijuana, down Baja and up the coast from Mazatlan), Mozambique, Zimbabwe and South Africa. While in Mexico and Mozambique he courted his future wife, Sharon, who was born in Mexico City and worked in international development throughout Latin America and Africa. They have lived in the Tucson area since 2002, raising two boys; the oldest is currently in the Navy training to become a Submarine Sonar operator, the younger a student at Ironwood Ridge High School. David has been running his own business as an assistive technology and special education consultant since 2006. He has been painting and creating since childhood. His mother has been a portrait and landscape artist since the 50s and she is still painting and producing ceramics in her 80s. He grew up with the smell of oil and learning slowly since childhood, through first hand observation and osmosis, the systematic, hard work and craft of the painter. His film and TV experience brings a critical eye on planning, time management, budgeting, production and editing experience to painting. His goal is to bring something unique to art in Catalina, AZ. 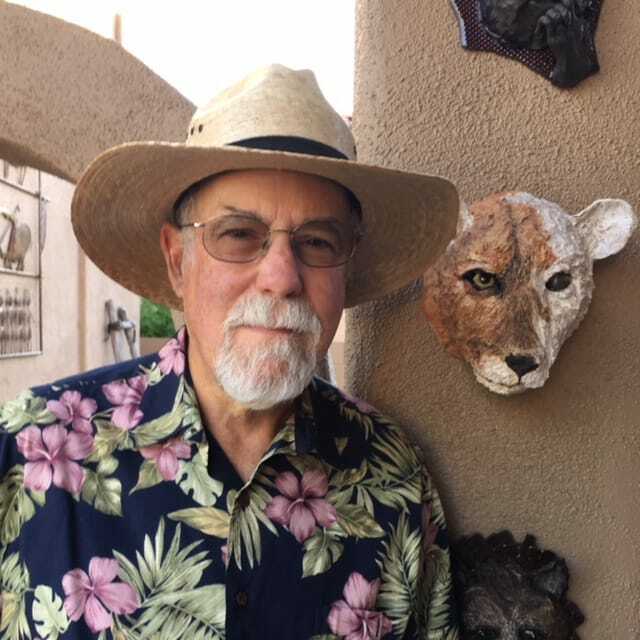 His travels in the past as well as his assignments have brought him to experience the Arizona back roads and trails by car and bicycle, inspiring him to create textured works inspired by petroglyphs and the rocky terrain of the Sonora. He has developed a mountain bike rig for PleinAir to enable the further exploration of Arizona, searching for locations not reached by car and too far to walk. Often, my best ceramic tools are my hands. The visual arts have always been my passion and focus of my life. My sculptural figures, relief pieces, and vessels are created using a variety of clay bodies which are completed with underglazes, glazes, and mixed media. They come to life with color, subtle gesture, or exaggeration of form. 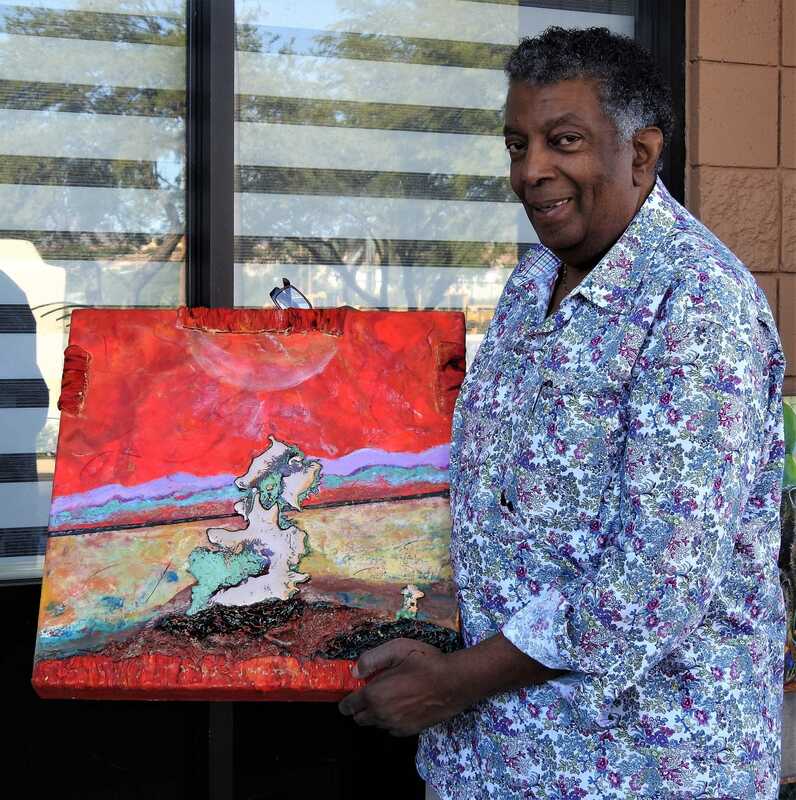 After a successful and fulfilling career as an arts educator and arts coordinator in New York, I moved to Tucson, Arizona and began to concentrate my energy on creating my own art work. Several years ago I gave myself "permission" to return to ceramic clay and the world of three-dimensional art. I love the immediacy and process of moving the clay to form my figures, both human, and animal. My current pieces are spiritual figures adorned with patterning and surface texture. They display a reference to world cultures and religions. The pieces also provide me with a drawing and painting surface, satisfying my love of detail work. In addition to my own work, I have been involved in an Outreach Program that has afforded me the opportunity to teach art to people from nine to ninety years old. There is no end to the joys of the creative process. The same voice I use to guide and motivate others to their creative potential, became the voice I called on for myself. The vibrant colors and spirituality of the Southwest are a source of motivation for my drawings and paintings. Next, I began to integrate the spirit, color, and energy from places I’ve traveled, such as Africa and South-East Asia. I’ve found many common design elements wherever I’ve been and brought them back home to my work. I was born and raised in New York and earned an undergraduate degree in art from the Pratt Institute. I continued my post-graduate education and earned a certificate for school administration and supervision from the University of the State of New York. Horses are a common theme in her paintings and an endless source of inspiration. They carry her across the desert and over mountains in search of new subjects. 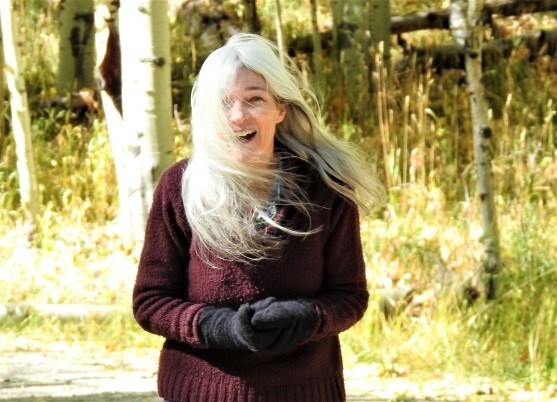 From their backs, she has observed newborn elk, bighorn sheep, and herds of wild horses, not to mention the beauty of nature, itself. 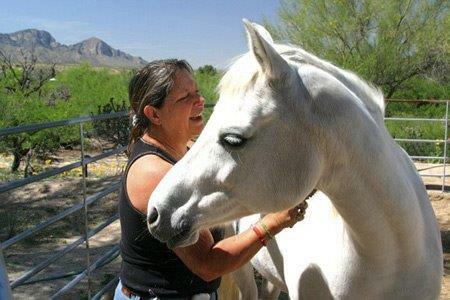 Often, inspiration comes from watching her children interact with their horses. She tries to capture these wonderful moments and emotions in her paintings. Usually done in oil, her paintings are detailed and realistic, varying in style from contemporary to sometimes a bit western. As an artist, she hopes to share the beauty and inspiration that God has shared with her. Sylvia wants her art to bring out the splendor of God's creation. Her travels have contributed to her love for bright, bold color. Sylvia spent much of her life living in California, as well as eleven years living in Hawaii. 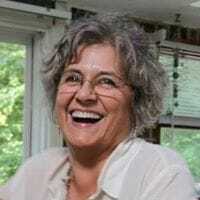 She has traveled extensively in Canada, Mexico, many parts of the United States, and abroad. Her home is now in Tucson, Arizona, not far from Tempe where her mother grew up. She is also a part time resident of Hawaii. Most often preferring to paint with layers of pure color and not doing much mixing, her paintings are vibrant, often reflecting her love for southwestern and tropical subjects. Sylvia has a love for parrots, and enjoys going to Oasis Sanctuary in Benson, Arizona, a parrot rescue. She loves donating to their auctions to raise money for their care. She has shown her work in galleries and art shows all over the country. It's her desire to convey joy, hope, love, and aesthetic pleasure through her work and wants more and more others to enjoy it for a lifetime on their walls! I call it orchestrated electronic art – my interpretation through photography. 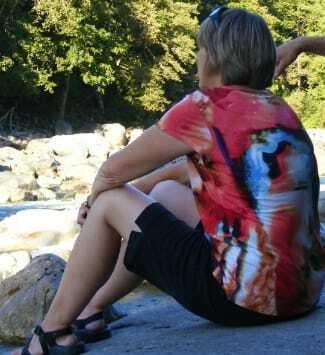 Sheryl is a nature photographer and loves spending time in the great outdoors. She utilizes camera-based images that have been significantly altered, distorted, restructured, and reformatted. 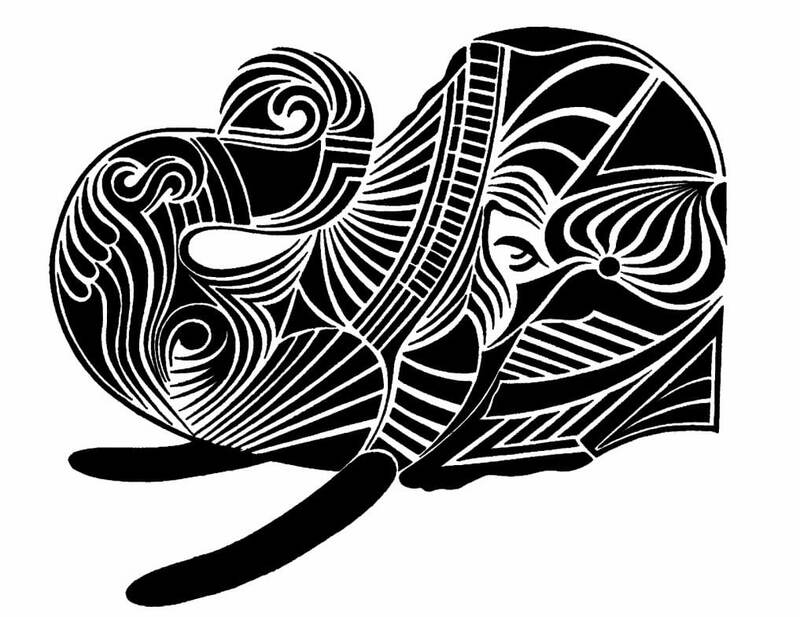 I have evolved from a lifelong dabbling in art to a serious pursuit of scratchboard and all things clay. While my art focuses on nature, the desert, and Native American cultures, the media I work in are incredibly different. Scratchboard requires both patience and detail, while my approach to clay is loose and inexact. Together, they strike a great balance and keep me grounded. I am a member of the International Society of Scratchboard Artists. My work has been featured at a number of local galleries, including two shows at the Arizona Sonoran Desert Museum. I’m proud to be a showcased artist at Absolutely Art Gallery & Gifts in Catalina, Arizona. Clifton is a member in both the Tsimshian and Samish Indian Nations. He was born in Bellingham Washington and raised on Orcas Island in Washington State. After living in Seattle for many years he moved to Tucson for sunshine and retirement. He first wove raffia and reed baskets in 3rd grade and has always been interested in basket weaving. Only in retirement did he find the time and teacher (Ruth Birkhead in SaddleBrooke) to start in again. He found he still likes it and enjoys weaving round reed baskets in vivid colors and unnatural designs. No two baskets are alike and his designs go where the basket wants to go. He enjoys the rhythmic motion of weaving and weaves many different patterns and colors into the baskets. His baskets tend to be large (good for setting on the floor, maybe in a wrought-iron stand to prevent bruising by vacuum cleaners and mops) or on a high shelf where their large height and girth show off dramatically. Having retired from the federal government after collectively almost 70 years of service, they began a new venture, photography and created Iron Creek Photography. After many years of international and domestic travel, they now travel at a much slower pace capturing beautiful landscape, nature and wildlife images. They endeavor to share their travels through their printed work. I’m a native of Tucson, so my work naturally encompasses the vivid and bright hues of the outdoors and the Southwest -- with a bit of whimsy added to each piece. I enjoy expressing myself in watercolor and acrylic on wrapped canvas, with scenes of nature and animals from around the world. Over the years, I’ve lived in New England and the Rocky Mountains while working as a commercial artist and illustrator. Currently, I paint full time in my Sonoran Desert studio. My work has been shown in numerous juries, galleries, and festival shows through out the country. In addition, I’ve been showcased in different galleries across Tucson for over 14 years. I continuously show new and fun paintings, cards and prints. Now, I’m beyond pleased to enjoy a relationship with Absolutely Art Gallery & Gifts. Since I took my first class in gourd art in 2006, I was hooked. It’s the perfect background to express my love for the Southwest. My husband is involved in the less glamorous side of gourds, the cleaning and preparation. Thanks to him, I can dedicate my time to the creation and design processes. My husband Larrie and I moved from Pennsylvania to Tucson in 2006, to retire in Saddlebrooke to build our dream home. Not only have we found our forever home, but it allowed me to enter a world of art. I continue to take classes to broaden my skills and learn new techniques. I’m a member of the Saddlebrooke Fine Art Guild and participate in several art shows throughout the year. I’m also a member of the Tucson Old Pueblo Gourd Patch and have won numerous ribbons at the Wuertz Gourd Festival. You can find my work in Absolutely Art Gallery & Gifts, located in Catalina. 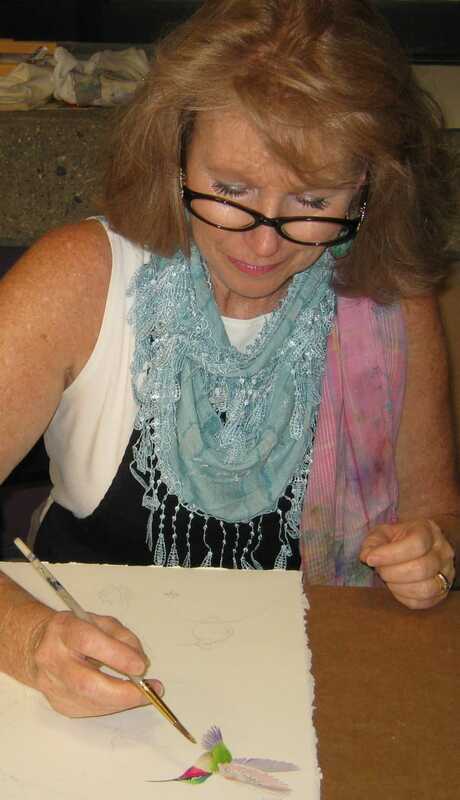 Kay began painting in watercolor upon retirement from the Pima County Library. Watercolors appeal to her because of the wondrous effects of light and motion that can be achieved. This same magical quality can also be achieved with alcohol inks and acrylics, the latter by the use of lots of water in the painting process. The American Southwest is a major motivation in her artist renderings. Also, she has a need for experimentation that she finds useful to keep her paintings fresh, lively, and interesting to her from an artistic perspective. Having begun painting at such a late stage in her life it has given her a purpose beyond anything she could ever have imagined! She hopes everyone enjoys her work as much as she enjoys creating it! We are a husband and wife team who have worked together for over 30 years. Our history in metal working began when we opened a welding and fabrication shop in Wasilla, Alaska. This successful venture allowed us to expand our knowledge and creativity with our metal work. Many art pieces, especially glass, are complemented with proper displays. We custom make each stand as a work of art itself. We enjoy designing and creating stands and frames for glass art pieces. We both continue to experiment with new designs and techniques, while creating unique works of art. Since leaving Alaska 15 years ago, we have lived in many places, such as Mexico, Minnesota, Washington, Mississippi, and Arizona. Tired of winter climates, we moved to Sierra Vista and realized this location was ideal for us. Tom has had a lifelong interest in art and sculpture. In grade school he was a class illustrator, frequently being asked to illustrate class projects. This inherent interest resurfaced after Tom received a BA from Miami University [not, however in art!] Subsequent to a year of concentrated art study post-graduation, Tom landed three of his paintings I a local Evanston, IL art gallery. Tom then joined a suburban Chicago Art Guild. He exhibited acrylic and mixed media abstract paintings. Within three years, three of his paintings received local awards. Reality, however, called. The time constraints of a career, young children and wife put Tom’s artistic drive on the proverbial back burner. For 40 years. Nonetheless, in 1990, Tom managed an entry into a juried regional exhibition at the Reading Pennsylvania Museum of Art. Now that Tom is retired and ensconced in the SaddleBrooke lifestyle he has been able to concentrate on painting and sculpture. 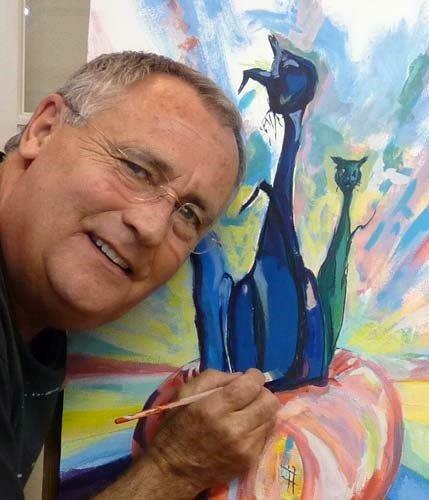 His current interests are acrylic, impressionist landscapes and mixed media semi-abstract landscapes. He now has the time to experiment with the creative approaches he has always wanted to try. Tom builds all of his paintings from scratch, utilizing canvas or Masonite combined with wood moldings to create a unique and unified finished piece. Craftsmanship coupled with creativity produce what Tom considers his signature approach to art. This includes “glassless” watercolor, a method he developed 20 years ago. Art, in many forms, has always been a part of Nancy’s life. As a teacher, she encouraged her students to include art in their work. As a small business owner, she created a space filled with the work of artists, designed individual gift baskets and worked with cosmetics for burns and scars. Upon arriving in Tucson twelve years ago, she finally had the time and freedom to pursue her own art. There is a strong art community in Tucson that encourages personal growth through classes, visiting national artists, opportunities to exhibit, and art organizations. Experimentation with watercolor, acrylics, collage, and assemblage while learning the principles of art and design encouraged further growth in mixed media. Tucson Gem and Mineral Show continue to provide inspiration for the creation of unique jewelry. This is especially fun since Nancy has a jewelry background. It is her desire to create pieces in jewelry and art that make a statement and remain timeless. She is always inspired by the work of others. Their creations allow Nancy to share space with them for a moment. The warmth and changing colors of the desert continue to influence her work. Because I live where copper exists in the earth, working with it has become my passion. Life evolves in the same way as the jewelry I create. When I pick up a piece of copper I see potential. The metal evokes a sense of possibility which begins the unique rendering of what is achievable. I enjoy the juxtaposition of the hardness of metal with the delicate textures of nature’s gifts such as seed pods, wood, or cactus skeletons. I find it interesting for hundreds of years, people have worn copper on their skin. Copper has healing properties and has been known to ease pain such as arthritis. I love that the metal I use to form into jewelry can assist with the healing process. My pieces combine copper with fine metals such as silver, brass, turquiose, fresh water pearls, cholla, ironwood, or leather. Some pieces feature brass and copper etched with petroglypch or drawings that have been adapted to the etching process. As an artist, Bonnie believes her work should capture the beauty and movement within nature. Her latest collection has been created by utilizing the technique of reverse painting on acrylic glass. By meticulously applying over thirty layers of bold, iridescent colors under glass, her artwork takes on a multidimensional, shimmering and reflective aura. While creating customized and commissioned pieces for her clients, she considers the overall design, the functionality and most importantly the budget parameters of the project. Each painting is completely unique, one-of-a-kind, and truly special! “The arts are so important on so many levels. Just think of the difference between a blank wall and one filled with art. 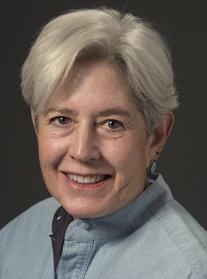 While attending the University of Washington, Theresa worked as a graphic artist. That part-time job turned into a full time career, as she rose from artist, to editor, to publisher. 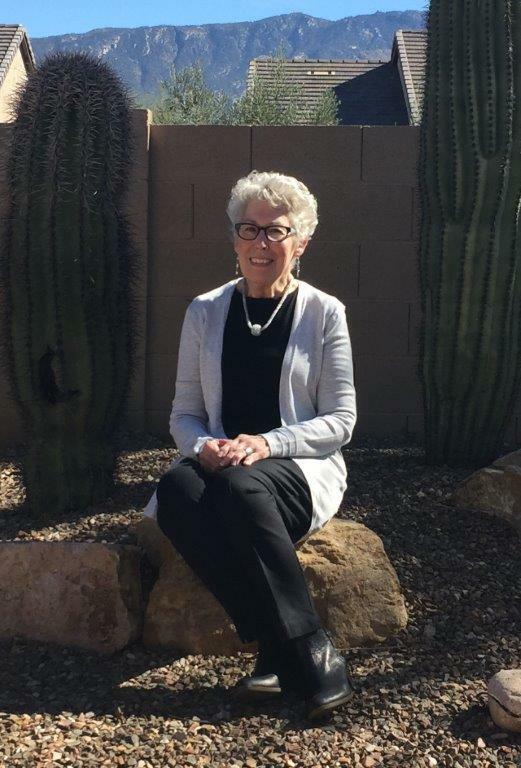 After retiring from publishing, she and her husband moved to their home in Tucson, where she still writes and designs for the Oro Valley Voice. "I have always painted as a hobby, although my job and raising a family left little time," she said. "When I moved to Tucson, I had a goal of learning to sculpt, taking flat images to 3D." Theresa has been studying clay sculpture for the past five years. 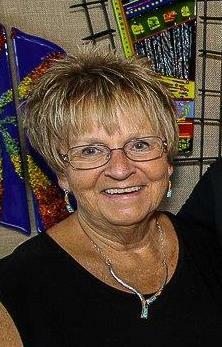 She has also served as president of Southern Arizona Clay Artists. With this organization she spear-headed "Arts from the Attic" — a fundraiser to raise money for arts education for children. 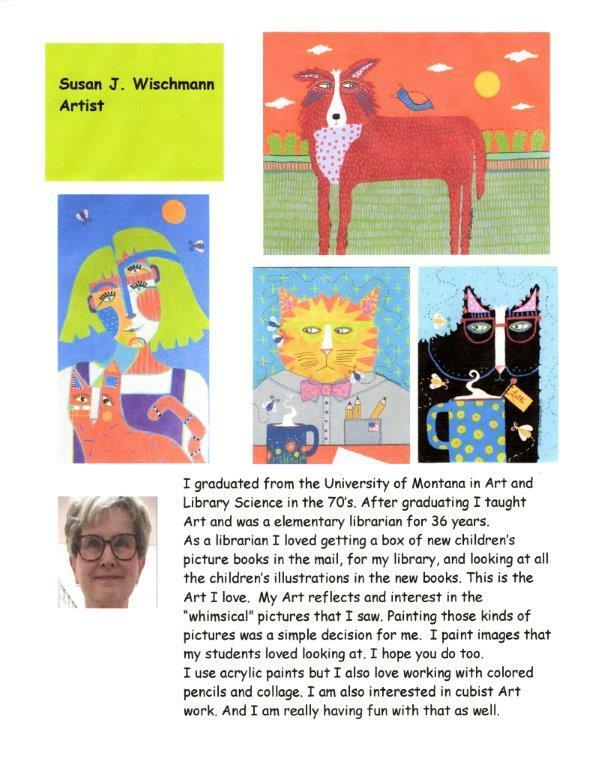 The story goes back a long way, from the realization that Judy loved to draw and paint as a little girl to changing careers midlife by returning to college for her art degree. Since life always evolves, her art has evolved from years of experience, from the skills she has picked up along the way and from the places she has lived. Sometimes the work is started by her saying "I can't do this. I can't do this." Then she does it. The place where she lives now is her inspiration. She observes and absorbs constantly. There is nothing neither more peaceful nor more exciting than being in the studio making something solid and enduring from the glimmer of an idea. Jo has been designing and creating art for friends and family since childhood. An art class inspired her to update her skills and create a larger body of work. In the business world she started as a graphic artist, designing and drawing Mil Spec Computers at ROLM Corporation in San Jose , CA. She also did computer graphics for Singer Aerospace and AlphaGraphics in Tucson. Her degree is in Business with a minor in Marketing. She loves to continue learning as much as she can about art and new methods, looking for classes to help with her yearn to learn. Mike’s first exposure to the art world began when he photographed flowers for his wife's paintings. After this, Mike started framing his own work and placed his pieces into art shows throughout Tucson. He sold his first photograph at his very first art show and never stopped. 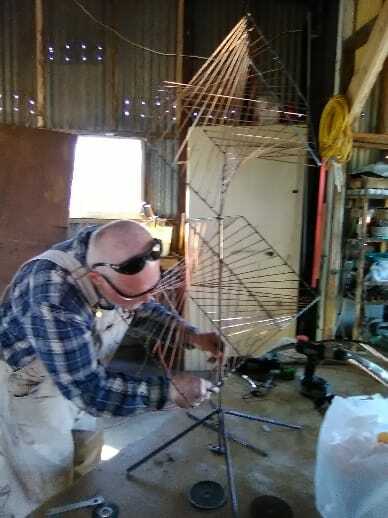 Recently, Mike has expanded his skills and also creates wire sculptures. In addition to his art, Mike has a Bachelor’s of Science in Film and Television production. He also has experience in the movie industry, worked in art department, and as a special effects explosives assistant. When Mike started working at Pima College in the Audio Visual Department, he expanded their offerings to video and computer graphics. He was also able to indulge his creative side through the digital arts, sculpture, and drawing classes. I love to share Divine Inspirations from Nature. I need nature and wildlife. Animals have been in my life since my childhood days. Our home was always filled with animals, from fish, birds, dogs, cats, hamsters and monkeys to name a few. I love all creatures. Every animal the Universe brought into my life I had an incredible relationship with each of them. I have lived most of my life in CA. My two beautiful adult children still live there. The last 20 years have been assisting veterans nationwide helping to obtain benefits with the incredible assistance of my sweetheart. We are known as "veterans’ friend" and currently reside in AZ. Outside of our busy schedule we travel local areas, and will cover miles for Wildlife, landscapes, nature’s art forms. The photographs are not photo shopped and many are limited editions. Also available are Pet Portraits-They are family too! My goal is to design artwork that is my own – no rules, no mistakes, no patterns to follow – just play and create. My life as an artist began after I retired from a career in Graphic Design and Drafting. I was ready to leave the world of precision and programmed drawing. I create my art using commercial and hand-painted fabric, adorned with thread painting, three-dimensional manipulation, and other embellishments. Inspired by the desert landscape, sunsets, and other beauties of nature, I create wall hangings with themes of floral abstracts, landscapes, people, and pet caricatures. My postcards are typically whimsical and seasonal. Fiber art has been created for centuries. I believe I’m bringing a new and fresh approach to a timeless art form. Join me at Absolutely Art Gallery for a take on my fiber art. The link between photography and metalsmithing may seem wide, but creating both brings me a sense of calm and joy. All my worries melt away when photographing birds or making a piece of jewelry; I don't think about anything but what I am doing. Capturing the beauty and personality of a bird in a photograph is such a high. Creating a piece of jewelry around a special gemstone is so thrilling. I enjoy all types of photography, but what brings me the greatest joy is photographing birds. Being able to capture their beauty is so exciting. I’ve had the honor of my image of a Pyrrhuloxia being selected for the cover of the January/February 2011 issue of the National Audubon Magazine. Two of my greatest accomplishments were having images published in two books: Peterson Reference Guide to Woodpeckers of North American and Woodpeckers of the World. 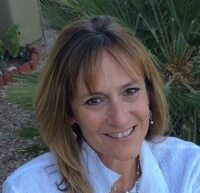 Risa Waldt, a native Tucsonan, grew up in the desert. 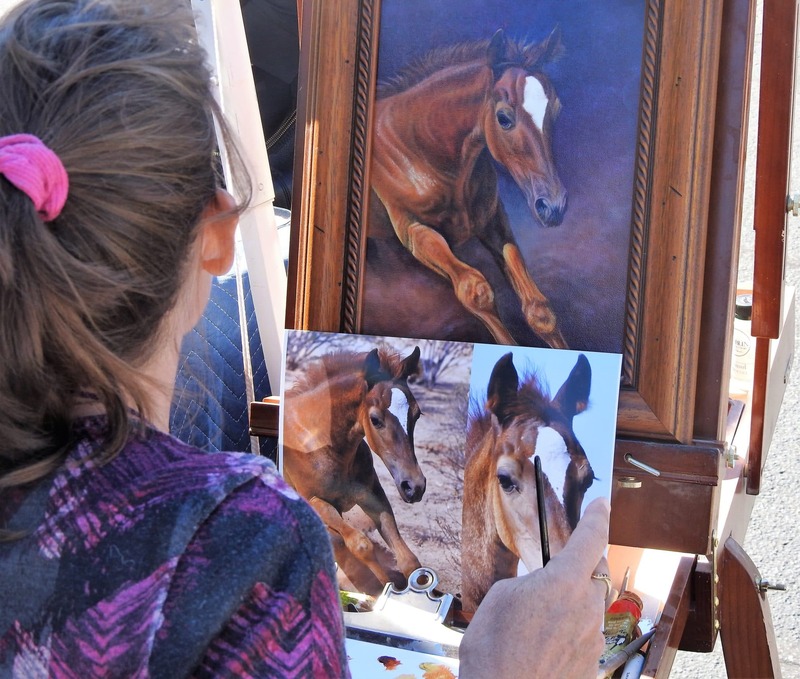 While horseback riding along the Rillito river, she soaked up a vision of the desert that pursued her until she began painting to express it. In 1973 she began a love affair with light, using watercolor. She loves to paint the Grand Canyon, wildlife, and historical features of Arizona. Waldt's watercolor of Tucson's Courthouse was purchased by the Tucson Museum of Art as a gift to the Harmsens for donating their substantial Western Art Collection to the City of Tucson. For a multi-media event with Orts Dance Theater, she contributed five large watercolors which were projected as a backdrop for the dancers. Ideas for these paintings came to her while listening to the music for the piece. An award-winning member of the Southern Arizona Watercolor Guild President 2003-2004 season, Risa is also a charter member of the National Museum of Women in the Arts (Washington, DC), an associate member of the National Watercolor Society and the American Watercolor Society, and an active member of the National League of Pen Women, and the Arizona Watercolor Association. Risa's Art is her contribution to World Peace, Serenity and Contemplation, Beauty, Honoring our Beloved Earth. Eldon is an "Emerging Artist" starting his art career in the front range of Colorado. HE and his wife Judy have recently moved to Arizona to enjoy a change in weather and be near family. He is primarily focused on creating large scale, multi-piece wall mounted artworks comprising panels and ancillary parts he fabricates from recycled materials; primarily salvaged hollow-core doors. This keeps the doors out of the landfill and these materials work well for the hard-edged approach he likes to use. Also, he likes the idea of windows and doors conveying us - visually or physically - between the security of a familiar space to the less certain world beyond. His works often consider the interplay between natural, man-made, and abstract elements. 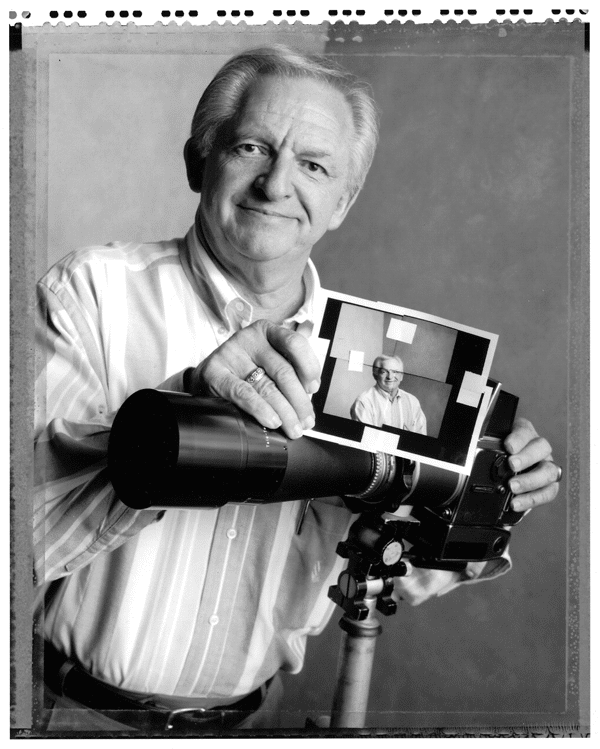 Eldon strives to spark curiosity at a glance, and provoke a longer or repeated viewing. He’s not really concerned with "style" or most traditional studio techniques. He says: I missed the class when they taught that a frame should go on the outside of a painting. Eldon grew up in rural eastern Colorado in a sod house (really); attended Colorado State University where he took Civil Engineering and Construction Management courses in addition to the Art curriculum. He worked as an architectural draftsman; did free-lance design/graphic artwork – primarily large scale “supergraphic” murals; designing furniture and hand-carved signs; was a planner for the City of Fort Collins; and a project manager and designer for an architectural/planning firm. 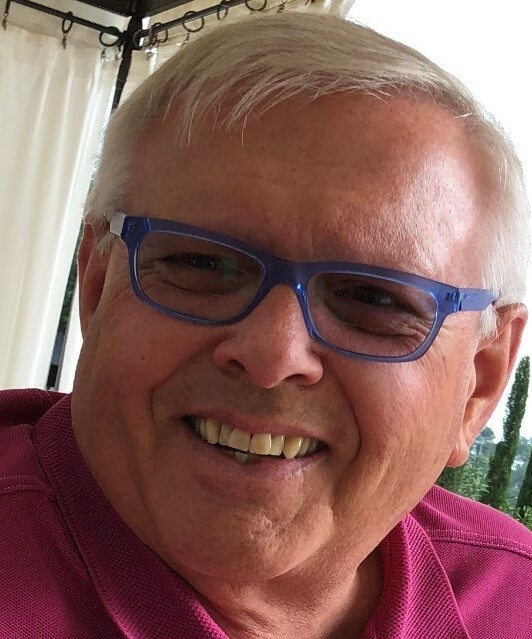 He was the owner of Cityscape Urban Design (planning and landscape architecture) for over 25 years, and was named “Entrepreneur of the Year” - for the accomplishments of Cityscape Urban Design - in 1994 by Fort Collins. 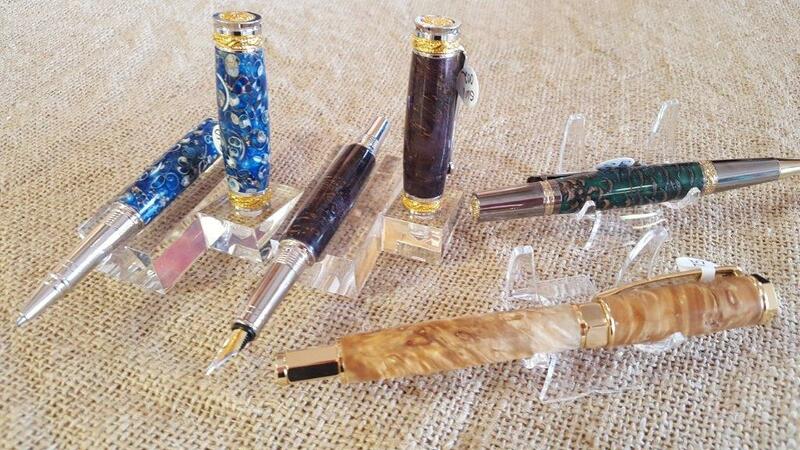 Steve is the creator and founder of Steph Fine Pens. For most of his life Steve was a fabricator for the aerospace industry, a life experience that shaped him to be a man of precision. Over the years Steve has invested time in the manufacturing of knives, clocks and tables that birthed his creative talents in design. He also was involved in the design of unique items of trade but found his true passion in establishing Steph Fine Pens. "There is nothing like the satisfaction of taking a piece of local and exotic woods or acrylics and turning a beautiful one of a kind pen – be it a ballpoint, rollerball or fountain pen." stated Steve. Since I was young enough to remember, I have always looked at objects, people & my surroundings as art. At a very early age, I began drawing almost anything. My fondest memories were the drawings of comic book characters and cartoons that I drew often. After dropping out of college where I majored in Fine Art & Graphic Design, my passion for art took a back seat to life. Now that I’ve begun to draw again, I realize that I’d forgotten how much creating art invigorated me, shaped me as a person & made me see life in a unique way. I think that art has the power to change the minds and souls of people and reach them in many different ways. If nothing else, I hope that when people see my artwork, it inspires them. Meira Yaer’s passion for art and bright color has permeated her career as author, lecturer, nurse and therapist. Upon moving to the desert in 1999 the compulsion to give her artistic nature full rein was irresistible. Meira had fallen in love with the desert. A prolific body of work followed wherein she developed her own techniques for layering watercolors, tinted gels and metallics to depict fantastic desert landscapes and universal native symbols. Meira’s imaginative approach to her subject matter is intricate and sparkles with deep color, bringing to mind mosaics of precious stones and metal. Her art has maturity and evokes a spirit of celebration. Meira’s ongoing career work in brain injury, recovery and advocacy has no doubt influenced her understanding and celebration of the valiant human spirit which carries through her art. A sensibility in balance of color and proportion of form allow her larger pieces to translate well not only into cards and prints, a secondary market to Meira’s success in selling original works, but also into very large scale art. Most recently, Meira is expanding art by exploring with acrylics and metallics on larger canvas, creating art that reflects shapes, and colors through a veil of Spirit.